Unique to Okinawa in Japan, Awamori consists of long grain indica rice and is distilled rather than brewed like other beverages such as Sake. In order to get its mellowness and flavour, it’s traditionally aged in clay pots. Originally, the indica rice was produced in Japan. However, growing demand for Awamori meant the majority is now imported from Thailand. In fact, a lot of itself is imported as well. How much alcohol is in Awamori? 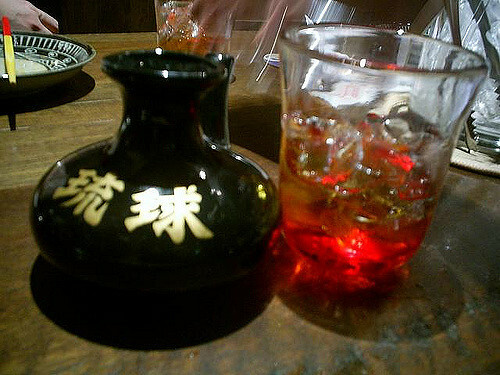 Awamori produced in Japan can easily be between 30 and 43 percent pure alcohol. However, the percentage can vary from one brand to the next. Export brands which have been shipped to Japan are sometimes 25 percent alcohol, whilst some are 60 percent alcohol and can be flammable. These are more potent and therefore should be consumed with care. How do you drink Awamori? How you choose to drink Awamori is up to you, however it’s traditionally served with water and ice. You can expect to receive it, without request, served with ice and a carafe of water in your local restaurant in Japan. If you’re looking to branch out from traditional, you can drink it straight (on the rocks) or in cocktails as well. Traditionally, it was poured from an earthen vessel with marble walls which reflected both the exquisite taste and the high cost. Water to Awamori: 6:4 ratio. On the rocks: Pour Awamori over ice. With hot water: Mix it with a 6:4 ratio of hot water. If you’re looking to make an occasion out of drinking Awamori, below are some great snacks to accompany it. In the beginning, a mold that helps with decomposition (black-kuro-koji) is sprinkled over rice that has been just steamed. This process helps with creating the rice malt. This mold, with the scientific name Aspergillus oryzae, is often also used to ferment soybeans for soy sauce, bean paste, and to saccharify rice for beverages. It also gives its interesting and special taste and smell. From this process, all of the raw ingredients are blended together, with rice being the focal item. This happens all before Awamori is put into clay pots to age and distill before being consumed by many of its lovers! Awamori originated in Okinawa, a Japanese island in the East China Sea. If you’re new to the area, are visiting, or call the area home, you are sure to have experienced what else Okinawa has to offer. From Shuri Castle, and other Ryukyuan fortresses, through to the Okinawa Prefectural Museum and so much more; there is so much to see and do. On your visit, don’t forget to visit Kokusai Street as well, which is lined with many shops and restaurants looking to immerse you in the local culture and distinct dishes. Do you love sushi but have no idea the different types of Sushi?